Sesame Brown Rice with Snow Peas, Thyme for Cooking spring side dish. 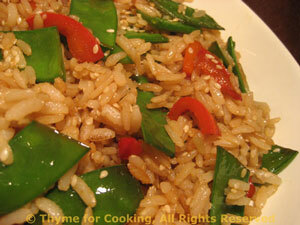 A cross between a stir-fry and a pilaf, the snow peas and red pepper add color and crunch to brown rice. Cook rice in chicken stock according to package instructions. Clean pea pods - snip off the stem end. Cut large pods into pieces, at an angle, if desired. Cut red pepper into matchsticks. Heat butter and sesame oil in a large nonstick skillet over medium heat. Add pea pods, red pepper, soy sauce and sauté 5 - 7 minutes, stirring frequently. Add brown rice and stir-fry quickly. To toast regular sesame seeds: Put them into a dry, nonstick skillet over medium heat. Toss or stir them about in the pan until lightly golden, 2 - 4 minutes.